I’ve always said that rock ‘n roll shouldn’t be overly analyzed and philosophized over. It’s best when stripped down to the essence of primal beats, loud chords, and huge sing-along choruses. 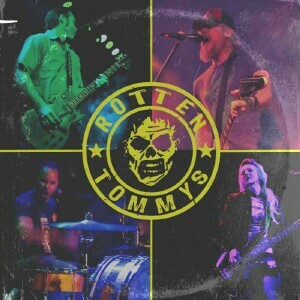 The Rotten Tommys have taken this formula straight from the garage to the stage, and now to your personal CD players. The attitude here is turn it up, rock it out, and don’t waste any time. Short, catchy, songs with no filler, sums up things well. Four Rotten Tommys, ten songs, and under 27 minutes total. Ray Davies and Pete Townshend would approve. Two guitars, bass, and drums… the way it was meant to be. A little snotty and a lot in synch with the “Ramones rules” of keeping it sincere, simple, and snorkin’. Like I was saying, this is rock ‘n roll, baby! It’s not calculus. The Rotten Tommys play out often because that’s what they love to do, and you should take the opportunity to experience the party. The RTs will be at Maybash this year on May 28, so, hey, you could even party naked at that one if you want! Also July 9 at The High Dive in Milwaukee with The HullMen and Northside Creeps.